The world of Tattoo’s and watches are intertwining further this year with this release from Linde Werklin. Having recently covered the Romain Jerome Tattoo DNA watch here is the latest watch from brand Linde Werdelin also featuring a tattoo concept theme and called the Linde Werklin Oktopus II Moon Tattoo. According to Morten Linde: “This is the most substantial LW product launch to date”. Linde Werdelin’s first foray into the moonpahse -dive watch was in 2010 when they launched their Oktopus Moon model with a unique luminous moon phase complication limited to 29 pieces. An improved version, the Oktopus II using more high tech materials such as ceramic and titanium came out in 2012 and then earlier this year the Oktopus II Moon watch appeared. 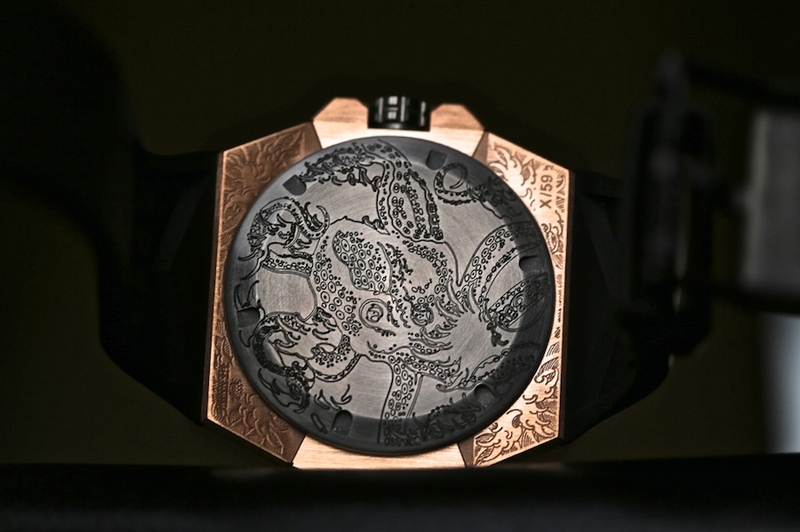 As a tribute to the models name and also one of the smartest aquatic invertebrates, the Tattoo edition features an intricate tattoo-style engraving of an octopus and its environment all over the case as is befitting a dive watch known as the “Oktopus” and also reflecting the mystery and intrigue surrounding this powerful creature. 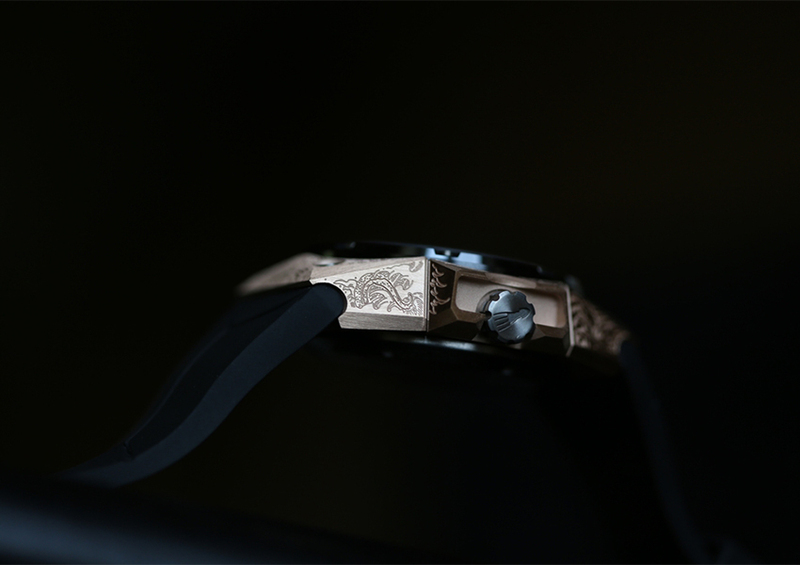 Other Octopus and sea-related figures and motifs have also been engraved on the delicately brushed and finished sides of the case, and a swimming octopus is engraved on the crown as well. The delicate craftsmanship of the case decoration is in sharp contrast to the angular case of the Oktopus model creating an interesting counterpoint and in a sense heightening the boldness of the case shape, this being a signature of the Oktopus line. I don’t usually like highly decorated watches but I find in this case the manner in which the engraving has been done really appealing. The engraving is relatively subtle which is why it appeals to me and it reminds me of some Panerai’s engraved watches such as the Luminor Jules Verne Sealand, which I also like. 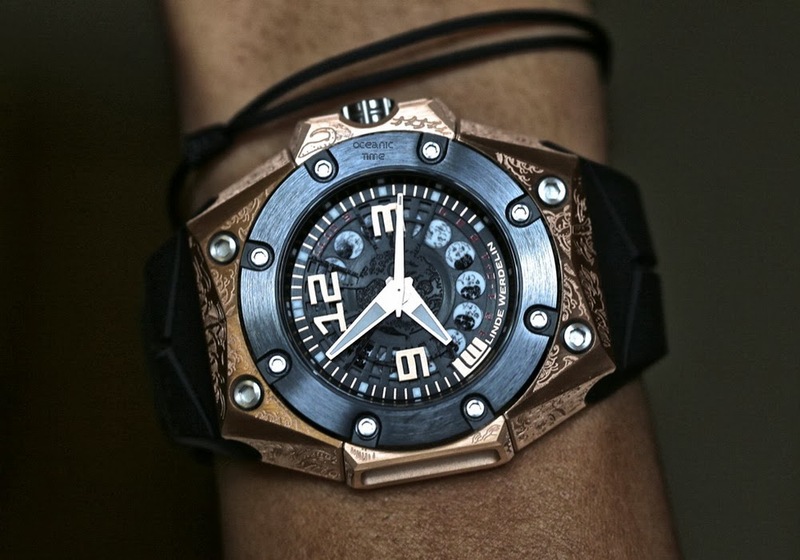 Linde Werdelin watches are known for their case construction, crafting a skeletonised case which is drilled to lighten the watch, this also strengthens the sport aspect of them. Its this combination of cutting edge-technology and craftsmanship that can be seen in the Oktopus II, the hand engraving has a three dimensional look to it thanks to variations in depth, while the high tech complex case construction makes the overall design feel very contemporary. 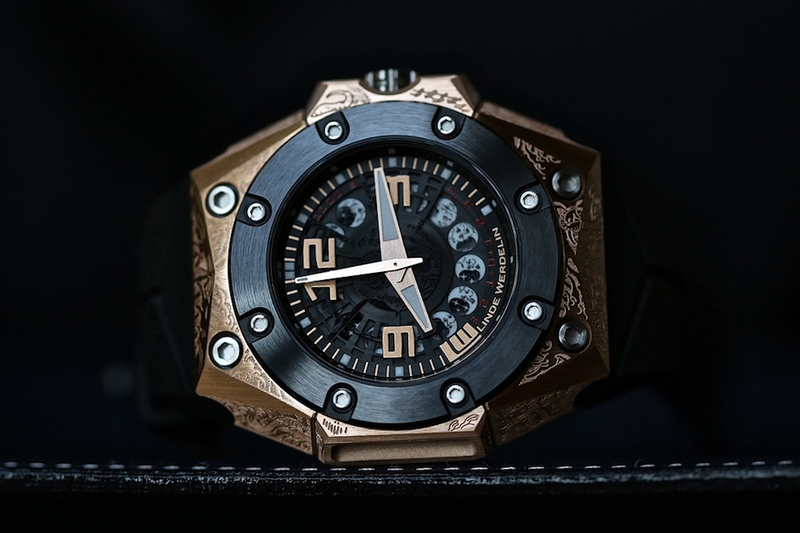 Linde Werdelin has been using this case design since 2012 and the 18k rose gold case of the Linde Werdelin Oktopus II Moon Tattoo is constructed from five separate parts utilizing materials such as ceramic and titanium which have been implemented to guarantee superb anti-corrosiveness. Subsequently the entire surface is then treated with microbillé and followed by a gentle hand satin finish. Linde Werdelin’s creative mind, Morten Linde explains, ‘the marriage between modern thinking and traditional craftsmanship resonates throughout an LW timepiece. The Oktopus Moon Tattoo is the perfect balance of contemporary art, technology and innovation; transporting poetry and imagination into the world of time keeping”. This being a limited edition each one is numbered with an engraving in the lower right lug -seen from the rear side. Inside the Oktopus II Moon Tattoo is Linde Werdelin’s first entirely conceived, developed and produced in-house complication, with a power reserve of 42 hours and balance frequency of 28800vph, 4Hz .It is securely sealed inside a titanium chamber inside the watch case with DLC screw in case-back and is water resistant to 300m. I really like the way the dial has been designed, the layering gives a nice 3D effect with the skeletonized dial revealing parts of the movement. Theres a lot going on here and disparate decorative elements have been combined into a very cohesive whole that doesnt compromise readability in any regard. So you are able to read the time easily, while also enjoying the subtle detail work that is going on. While it features a multi-layer skeleton dial much like other Oktopus II Moon pieces this Oktopus Moon Tattoo model has a slight difference; in keeping with the Tattoo concept each moon has been hand-stenciled with different faces instead of using plain luminous moons on a disk. An octopus has also been unobtrusively engraved on the upper part of the dial further adding to one of the most visually interesting dive watch dials I have seen. According to co-founder Jorn Werdelin this latest model is “Testifying to Linde Werdelin’s commitment and skill, the latest addition to our dive series represents the most prestigious and lavish piece of our collection yet”. In a clever piece of marketing whimsy they are releasing this edition in 59 pieces, which, since onee moon phase cycle is equal to 29.5 days it will be an edition of two moon cycles. The retail price for the Linde Werdelin Oktopus II Moon Tattoo will be 42,500 Swiss Francs and it will be available at Linde Werdelin retailers as of this month. 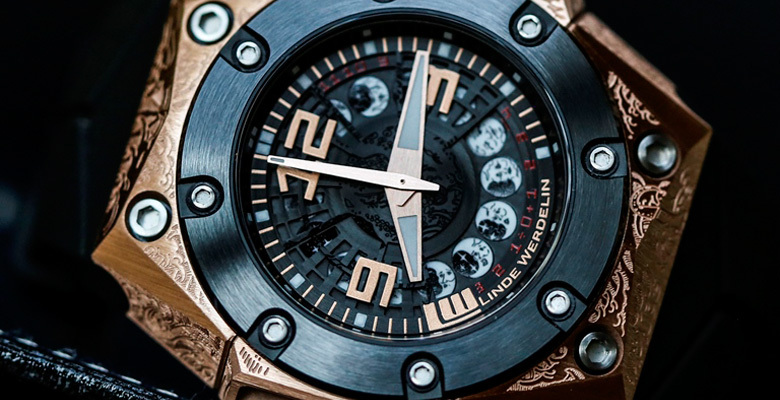 More resources about the Linde Werdelin Oktopus II Moon Tattoo available on ABTW, The Horophile, and Fratellowatches. 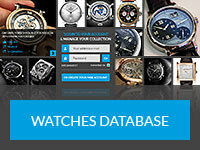 And on the Official Website of Linde Werdelin. Matthew Boston has worked in the computer graphics industry for 17 years in various parts of the world, currently residing back home in the UK. His interest in watches was first piqued as a youngster when he was fascinated by a Seiko digital watch he received. He's also founder of UniqueWatchGuide which is dedicated to sharing the news about timepieces that are unusual, unconventional and more often than not unobtainable.